I love Google Classroom. Each of my Library/Media classes, and my Media Medics group, have a Classroom. I am able to be more efficient in sharing and receiving information, links, documents, and comments, so I can be more present while my students are present. inefficient navigation and an overflowing inbox. Control-F: Search the page for a specific keyword or phrase. Control-Minus: Zoom out, making screen content small and therefore showing more of the boxes. Classroom automatically generates a message each time an assignment or question is posted. After the first grade level assignment, my inbox swelled with automatically generated notifications about postings and comments. The amount of information was so overwhelming that I decided to disable all Classroom notifications (via Classroom Settings page). However, Classroom also lets me know each time a student sends a private message. With 20+ active Classrooms, I am not checking each assignment or section on a daily basis. For this reason I re-enabled the feature, and the deluge of messages that clutter my inbox. At this time, notifications are all or nothing. Perhaps at some point Google will allow teachers to enable or disable choose notification types (fingers crossed). Click Gear icon, choose Settings. Click Filters and Blocked Addresses tab. At bottom of list, chose Create a new filter. A small popup will appear attached to the Gmail Search box. 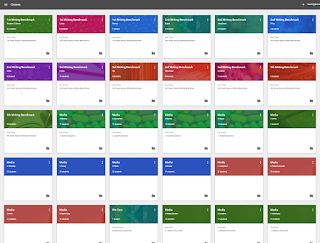 Paste "classroom.google.com" (without the quotes) in the From field. Click "Create filter with this search" link (lower right corner of box). Gmail will perform a search using this criteria, you should only see the automated messages sent from Classroom. In the popup box check the box to Skip the Inbox (Archive it). Next check the box Apply the label. Click the dropdown for this option, choose New label. Enter Classroom as the label name, click Create. Click the checkbox to Also apply filter to matching conversations. Double check your settings, then click the blue Create filter button. You will see the new Classroom label/folder in the left margin. Click that to see your filtered messages. If you want to get really fancy, it is possible to flag notifications for Private Comments differently than other messages. Add "Private comment" (without the quotes) to the subject field (step 5 above).